Flyers is rated 4.7 out of 5 by 69. Handout flyers to create lasting impressions with potential and loyal customers. "Flyers are an important part of our marketing department… I attribute the success in sustaining this campaign to PrintPlace’s affordable prices and unparalleled customer service." Rated 5 out of 5 by Taco from Perfect Quick turn around!!!!!!!!!!!!!!!!!!!!!!!!!!!!!!!!!!!!!!!!!!!!!!!!!!!!!!!!!!!!!!!!!!!!!!!!!!!!!!!!!!!!!!!!!!!!!!!!!!!!!!!!!!!!!!!!!!!!!!!!!!!!!!!!!!!!!!!!!!!!!!! Rated 5 out of 5 by David Rashon from Great Flyers!!! Club Flyers arrived fast and EXACTLY as designed. Definitely will order more and highly recommend Print Place. Thank you! Rated 5 out of 5 by Mendocino Experience Tour from Quality printing at great prices with a quick turn They did a great job. Our fliers look beautiful,. The price was right, and the quality was excellent. We'll definitely be using them in the future! Rated 5 out of 5 by Musique from Beautiful Flyers I had to use a low resolution image and the print quality was still great! Rated 5 out of 5 by Melissa A, from Great quality, quick turnaround. Very pleased! I order a lot of printed products and I have to save print place website is the easiest and most intuitive website I’ve come across. Product is great quality and was delivered by the date promised. What more can you ask for?! Rated 5 out of 5 by Super Developer! from Great quality, fast shipping!! I am very pleased with the flyers I ordered, place two orders, both are great, colors are sharp and just what I wanted! Super fast turn around! Rated 5 out of 5 by JRdz from Great flyers Our flyer came out great and arrived very quickly. Rated 5 out of 5 by Kenh from Great quality, great service I had a slight problem with the files and customer service went out of the way to solve the problem and get me the delivery on time. Rated 5 out of 5 by Dani from Good quality Flyers were printed on glossy on one side - good quality stock. Overall good print! Rated 5 out of 5 by Drinda from Flyers with 80 lb. paper I have bought these flyers with a different printer before and the 80 lb. paper was heavier than Print Place. That is the only bummer about the entire process. But that was more my education than the fault of Print Place. I will be back! I love the EXCELLENT customer service and the prices! Customer service means so much to me and obviously it means a lot to Print Place too! Rated 5 out of 5 by Bobby13 from Love the service Awesome work. Even better turn around time. Look forward to future business. Rated 5 out of 5 by Meghan K from Fast and easy I have used print place in the past and have always been satisfied with their product pricing and quality. This time I was happy to see that they have a fulfillment center in my neck of the woods, getting me my product 3 days ahead of schedule. Rated 5 out of 5 by AbbieG from Exactly what we were wanting! The flyers we order turned out exactly like we were wanting, great prices and timely turn around! Rated 5 out of 5 by Holli from Nice flyers! Nice job. I'm very happy with the quality of these flyers. Rated 5 out of 5 by Bootsy from Great stuff I’m happy I used the service. Thanks it was great. Rated 5 out of 5 by SaaSprovider from Fast and easy. From start to finish, the entire process was fast, easy and painless. Rated 5 out of 5 by Kang from Very Satisfied! I was very nervous to get prints at first because this was the first time and I didn't know what to expect, but after much research, I placed an order with Print Place. I put in the order Thursday afternoon and they were ready for pick-up by Monday! It was so fast and not to mention a really fair price. Quality was nice as well. Overall very satisfied. Rated 5 out of 5 by ByGiftyJane from Freaky fast service! I ordered on a Tuesday, chose 5-day turnover and got it at my door on Saturday! Plus the quality was amazing! Thank you Print Place. As I grow my home business, this will be my primary (if not ONLY) source of materials! Rated 5 out of 5 by tjacobus from art flyers and cards Great service. I've been using you guys for years. You have never given me reason to go anywhere else. Thanks! Rated 5 out of 5 by tivicrdotcom from The best! We always order them We use them always for our clients in Costa Rica just because we know they will always receive the best quality! Flyers give you a way to communicate with a crowd. As such, your flyer should be easily digestible at a glance. It should take no more than a couple seconds for people to see what you’re trying to communicate with the flyer. Are you offering a coupon? Are you inviting them to a grand opening party? Whatever your core message, it should be simple and easy to spot on the flyer. Because of the fast nature of communication, consider not folding a flyer. The option is available, but the more steps you ask of your audience, the less likely they are to see your core message. One, A single unfolded sheet with concise communication is ideal for a flyer. It’s important to constantly call attention to your brand, whether you’re a newcomer or a household name. 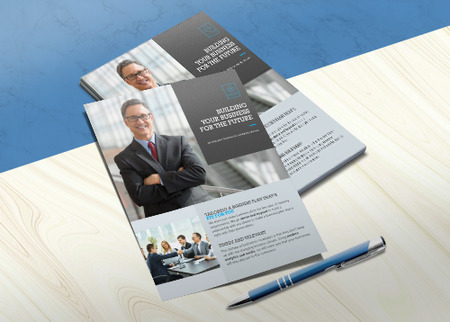 Business flyer printing lets you reach that intended target audience. High quality flyers shift a customer’s focus to your new product or service with a central image and informative text. Hand out as real estate flyers or give away a promotional announcement at your store front or at a convention to attract the right attention. We provide different options for Custom Flyers that includes type of Paper and cardstocks, protective coating options, and standard to custom sizes. This additional features instantly highlight your unique products and services. We also offer five folding options for easy transport and storage of large quantity orders. For more information, check out our blog post that explains paper stock and coating options in detail. Good to Know: Use the advanced options on the online calculator to create a custom flyer. Add perforation that can serve as a tear-off coupon or a discount deal for your customers. You can also use flyers for polical campaigns, restaurant promotions, and educational purposes. Print flyers with us today and get your brand name out there. You can easily upload a ready file online or use our online design tool. What are the most durable materials available? 100 lb. is the thickest among the paper stock and the 16 pt. cardstock has the greatest weight among all of them. Those who need flexibility and easy storage can opt for the 100 lb., while the 16 pt. is likely to last the longest. Which size should I choose for my flyers? The standard 8.5” x 11” is a popular choice as the space is large enough for an image heavy design. The 4” x 6” is the standard for smaller sized flyers given their handy and easy to store size. Customers can refer to the flyer when they get home or bring it over to your store. What should I keep in mind while designing the flyer? Color choice determines the effectiveness of your business flyer. A bright or bold color attracts a reader to pick up the flyer, while a dull one will go unnoticed. If you want to entice customers with a fun approach, stick to orange and yellow shades. Companies that require a more professional tone can opt for cool shades such as blue, gray, and green. Does the printing turnaround include the number of days to deliver my order? The printing turnaround indicates how long it takes to produce your business or custom flyers. You can choose from 1 to 5 business days for printing your order. Our free file check option lets you check the design before we proceed to printing. What is the benefit of selecting a folding option for my flyer? Folding options make it easy to store and transport large quantity orders. The fold you choose will depend on how you want to organize the flyers before handing them out. Our layout templates will show you how to format your artwork. This ensures your flyers print correctly. Our flyer layout templates are downloadable as EPS, PDF, JPG, and Publisher files through a desktop computer. Why not mail and print flyers from one location? Our direct mail services include the processing of 1 mailing list, duplication removal if requested, CASS Certification, inkjet addressing, and postal presorting for automation rates. Our direct mail services cost is $24 for an order of 1,000 flyers with an $85 setup fee. Tabbing can be added during the ordering process. Read the “Flyer Mailing Requirements” for folding and tabbing guidelines. Unsure how to make a flyer? Keep these easy tips and tricks in mind while creating your very own design. Keep your target customers in mind. Use colors, text, and images that will appeal specifically to them, not just to the public as a whole. Corporate businesses aiming for professional branding should use blue and green elements to convey a sense of authority and trust. Fun, fashion-forward brands or restaurants can excite customers with orange, red, and yellow elements. High-end brands normally go for a minimalist approach with a black and white inspired design. Make your flyer design simple and easy to read. Stick to a straightforward approach for flyers that will be distributed to schools and small communities. Club flyers should be extravagant but not too busy. Make sure the design leads the customer to your main point or announcement. Important information such as an address, date, and contact number should be easy to find. Where you distribute your business flyers is also very important. Distribute them in areas where your target customers will most likely see them. It is easier to attract business in relevant locations. Real estate agents can hand out flyers in malls or retail areas near the residential location they are selling. Small businesses normally distribute right in front of their store or in nearby streets. New companies can get their name out there at conventions, trade shows, and other high traffic marketing events.